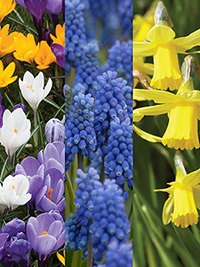 A selection of reliable early flowering bulbs to get children interested in bulb gardening. Crocuses, muscari and daffodil Tete a Tete are all very early flowering and kid-sized as well. Suitable for pots or the garden. Click Add to add to your cart or wish list.